I was at a chaps place who was selling up to collect another item, and spotted the saw. 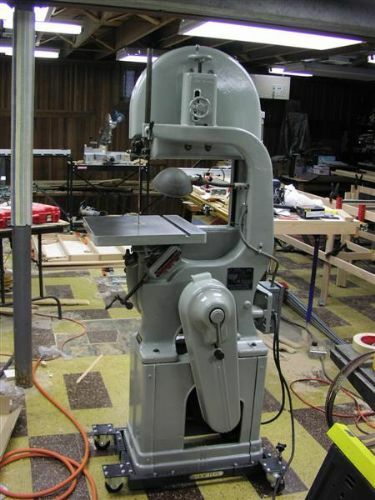 I dont need a bandsaw, and was even thinking of selling my existing bandsaw, as i never use it (warco). But this one caught my eye. Its proper old cast, with almost art-deco styling. Its a lovely looking object. Its missing the guard for the belts. Which is a lot of its visual appeal. I know the table etc. are not fitted in the photos, but it has that. Im now in two minds. As i say, im not a band saw chap really. Id find space for it if i thought i could get the guard, but, on an american saw, thats realistically never going to happen. And it might just irritate me for ever after that the guard is missing. I mean its not like you could easily knock one of them up! I think the one in the photo is 16", whilst the one ive been offered is 14". I know many on here would say "just buy it" but i dont have a warehouse for storage, and ive got enough projects to last 2 life times, so i need to be realistic. spencer 427 and The_Yellow_Ardvark like this. I can only speak for myself, but if I had the money, space and means of transport I'd have it. Note the instructions only mention non ferrous metals, plastic & wood. bigegg, Hopefuldave, zx9 and 2 others like this. bigegg, Hopefuldave, ukracer and 1 other person like this. The steel guards are easy enough to make - i made one for my compressor. The original one would have been cast though, and its got all that stuff where the guard is locked on by the cam (?) fixing on the pulley. I found this photo (above) on an old ebay listing (long gone). I mean the guard alone is a proper "object" and, if im buying with my heart rather than my head, id want to keep the charm of it. Ive been on about casting for some time - maybe this would be the final motivation that id need. I reckon in the states, it wouldnt be hard to find someone to "lend" a guard for pattern making (i mean even using the guard directly as the pattern) but over here, i know theyre way way less common. Hopefuldave and Parm like this. Make one out of 1" stainless mesh, then you [and visitors] can admire the workmanship of the twirly bits as it works. Seadog, Parm and fizzy like this. Maybe the part/s you needed may be more available over the pond. I mean its not like you could easily knock one of them up! if it's cheap enough, just get it and worry about keeping it later. the guard is not that difficult to make - if viewed as seperate shapes stitched together. me personally, I'd make it from 6mm MDF or good ply. once the edges are rounded and it's filled and painted it would be indistinguishable from original. slim_boy_fat and pedrobedro like this. Its coming from the same place as i purchased the replacement wadkin ags from. That was described as complete but in bits - when i got there, of course, loads of bits were missing, but it was ok, as it was cheap enough, and had the fence bits that were stuffed on mine. I was hoping that i might be able to build up 2 AGS 10s, when i finally get the table from the AGS250 (assuming it fits - i still dont know) but there are enough irritating bits missing from this latest AGS, that i doubt it will be sensible to spend the time / effort remaking bits. The reason this is relevant is that, i fear, the band saw might have hidden surprises of parts missing, and i dont just have another copy to make one good one from the two bad. But then a band saw is a bit simpler, i guess. I saw the table when i was there. I suspect the original fence is long gone, but im not hugely fussed about that. I just need to be sure that there are not other bits really, but the complication is that the seller is not a fan of tech, and certainly wont be snapping photos of stuff on his landline phone... And he is an hour and a half away - which is fine for picking up a purchase, but not close enough to nip round and check. If i was a bandsaw user, then id snap it right up - and, indeed, i have confirmed with the seller that i will take it, so thats that, but im still not 100% convinced its a great move! Ill have to sell my Warco bandsaw on here, otherwise my partner will start getting even more agitated then she was when the 2nd AGS10 turned up in the back of the car! slim_boy_fat and bigegg like this. Of get that and tidy it up then keep it in the house. But we do have a collection of treadle sewing machines already. I sold my Fobco as I count find a guard so understand what you mean. The other issue is that they're in the states, and want more for the cover than I'm paying for the saw.... And that's before shipping from the states... And then the enevitable import charges... And paying someone to Tig up the poorly formed sections. I'm wondering if I couldn't try and model the guard from measurements in some 3d software, and then CNC a pattern out of MDF, with a bit extra to account for casting shrinkage - then cast it myself. Obviously if i was accounting for hours, it would be cheaper just to buy one from the states... But it could be an interesting project. I doubt there is all that much market for them this side of the pond. Walker turner seems to be as ubiquitous in America as, say, Wadkin is here. And vice versa for lack of interest - so far as I can tell. But, yeah, the thought had crossed my mind also. But, given that id only be working from submitted measurements, rather than having an actual part to copy, I suspect the finished job would only ever end up an approximation too. And people are unlikely to really want to pay for an aproximation. I doubt I'll ever be able to get it spot on without a copy to measure personally.